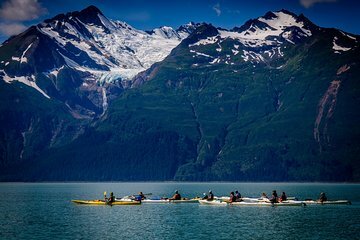 Paddle Alaska's Inside Passage on a sea kayaking trip from Skagway that explores a dramatic coast lined with towering peaks. Watch for bald eagles, moose, and whales as you paddle a 2-person kayak, then come to shore for a picnic on an Alaskan beach. For even more time on the water, you'll make the round-trip journey between Skagway to Haines aboard a high-speed catamaran, a 17-mile trip that traverses scenic Lynn Fjord.